Most of us have been there, we’ve been planning to go to a music and arts festival with a group of our besties for an age. The tickets are all bought and payed for, we’ve arraigned all our transport and worked out where and when we’ll be meeting up with everyone. We’ve even talked, in depth, about all the amazing things we’re going to see and do when we arrive BUT, suddenly, it’s time to pack, and, we don’t know where to start! Well, here we are to help! When picking your festival wardrobe, you obviously want to fill it with all sorts of wild and wonderful outfits and we whole heartedly encourage this. We do however recognise from our collective festival adventuring experiences, that there are a few items which on a practical level are just ‘’best to avoid’’. There are also what we call ‘’the essentials’’ AND some great items which we shall call your ‘’Festival staples’’. Once you are aware of these items you will be much better equipped to pack for and take on a full festival of fun! The main reasons for avoiding certain things are quite simply that they are impractical. Bearing in mind that at at least 99% of festivals there are very few opportunities to properly wash yourself let alone anything else: and that, you will be constantly manoeuvring your way through large crowds of people. People who’re often either intoxicated or carrying beverages or both and as such more than prone to spilling stuff all over you! There are then the potential lakes of mud, clouds of dust, down pours of rain, the general dirt of living on the ground and, of course, those ever dreaded and sadly never forgotten filth ridden festival toilets! Play suits, catsuits, body suits and one-piece swimming costumes = These may look and feel great on but be sure that you are prepared to put up with having to essentially ‘get naked’ every time you need to spend a penny. Be prepared also to get caught in that situation on at least one occasion, due to people walking in on you, through one of the many toilet doors which inevitably get broken during the madness of the festival. Long dresses that button up = These can be a great garment if warn responsibly but can also be prone to popping open at rather inconvenient times and buttons do tend to pop off when caught underfoot when getting in and out of tents and up from around campfires. Anything with long dangling bits = Again, after you’ve been in a few well soiled portaloos you’ll know that even the idea of wearing something which has dangled into ‘all THAT jazz’ is a very unpleasant one! A water proof Mack or plastic poncho = We can’t stress just how important this really is! If the heavens do open up on you, getting dry at a festival can be really difficult. Also getting and staying wet, can potentially make you ill or at the least very uncomfortable and/or cold and as such totally ruin what could have been, with just this tiny bit of extra prep, a glorious and enriching adventure! Extra socks = Always! 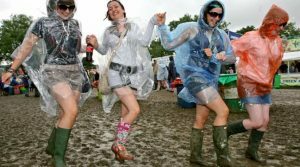 It is essential that you look after your feet when festivaling! Sunblock = Okay we understand that this is not clothing but unless you like the peeling, skinned lobster look it is an essential piece of kit! Shorts = These are one of the best things you can take when festivaling! They are so multi-functional it’s almost unreal! If chosen wisely then they protect your dignity, are easy to navigate the loos with, they’re comfortable and can help avoid any rub rash caused by lots of walking/dancing in hot weather. They can also be worn in myriad different ways and found in many, many different styles, look great with all kinds of footwear AND you’ll find that if the rains do come – Legs are a lot easier to dry than trousers! Leggings = These little beauties, which come in so many different styles and colours that you’ll be spoilt for choice, will protect you from both the sun and the sometimes shockingly cold nights, they are ridiculously comfortable and look great under shorts and dresses as well as with boots or with sandals. At least one warm jumper or hoody = Those summer nights can get shockingly cold, really and having a least one really warm and comforting jumper or hoody can mean everything when you’re feeling fragile. Sarongs and Scarfs = These are great little bits of kit! You can use them in so many different ways – From shading yourself from the sun and as seating, to numerous varieties of skirt, dress and top styles and even as extra bedding if needed. They’re awesome! A good Bum Bag of Pair of Pockets = For totally secure, hands free dancing a good quality Bum Bag is really useful and allows you total freedom of movement without always having to lug around or keep watch over a hand bag. Keep an eye out for Part 3 in this series AND Happy Festivaling until then!